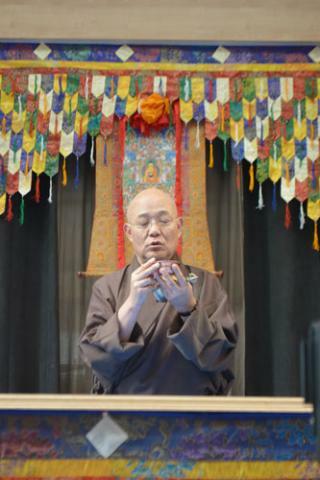 Renowned Tibetan Buddhist scholar, spiritual leader and artist Lama Losang Samten is preparing for a visit to the West Kootenay where he will create a compassion sand mandala while sharing his wisdom, teachings and stories with all who are interested. The warmth and beauty of the West Kootenay made a lasting impression on Lama Losang Samten when he visited last summer and now the venerable Buddhist Tibetan scholar, spiritual leader and artist says he’s looking forward to his return. Samten traveled to the East Shore’s Yasodhara Ashram to lead a Buddhist Meditation Retreat in 2013. Stopping in Nelson on his way home, Samten was taken with the small waterfront community. One of the highlights of Lama Losang Samten’s visit to the region next month will be his creation of a compassion sand mandala at Nelson’s Shambhala Centre (812 Stanley Street). Samten is world renowned in the ancient Tibetan Buddhist art form. Samten returns to the Yasodhara Ashram on September 12-14 to lead another retreat, but this time he is spending more time in the area. Before and after the Yasodhara retreat, Samten will share his perspectives and life experience with the Nelson community. Two highlights of Samten’s visit include the construction of a sand mandala at Nelson’s Shambhala Centre and a Selkirk College sponsored talk at the Nelson United Church. Samten was born in central Tibet and in 1959 his family was forced to flee to Nepal. He later moved to Dharamsala, India where he first met the 14th Dalai Lama as a 10-year-old boy. Samten eventually became a Buddhist monk and then served the Dalai Lama as his personal attendant from 1985 to 1988. In 1988, the Dalai Lama sent Samten to the United States to demonstrate the sand mandala art form. His initial creation at New York City’s American Museum of Natural History was the first time that a Tibetan mandala was constructed in the West. 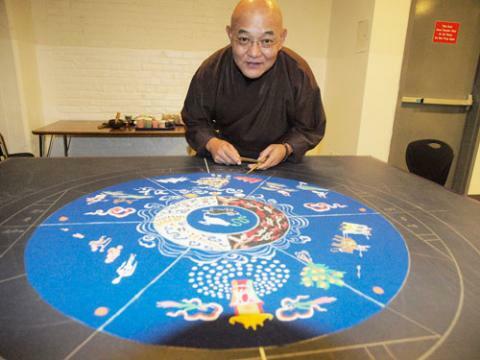 Since that time Samten has created hundreds of mandalas all over the United and States and Canada, educating people on the ancient Tibetan Buddhist sand painting. “It is intended to uplift and benefit not only every person who sees it, but also to bless the environment,” says Samten. Samten invites the public to come and check out the creation of the sand mandala while he is building it in Nelson at the Shambhala Centre. Samten will be working on the compassion mandala at the Shambhala Centre (812 Stanley Street) from September 7 to September 11. As he has since 1988, Samten is inviting the community to come to the Shambhala Centre to watch the creation of the mandala, ask questions and share stories. The intricate work will take place from 10 a.m. to 1 p.m. and then 2 p.m. to 5 p.m. during the five days. An important part of the sand mandala is the ritual destruction which is highly ceremonial. Samten will be taking the sand to Kootenay Lake where it will be released back into nature. The public is invited to take part in the ceremony and walk from the Shambhala Centre to the lakeshore starting at 5:30 p.m..
“I am very much looking forward to that, you have a beautiful lake,” says Samten. In the mid-1990s, Samten was asked to be the spiritual advisor on the movie Kundun which set out to depict the life of the 14th Dalai Lama from his birth to his journey to exile. The 1997 epic biographical film was directed by Martin Scorsese and went onto critical acclaim. Along with his role as advisor, Samten also acted in the film. On September 10, Samten will show behind-the-scenes slides of the making of the movie and share stories on his experience during that time. A question-and-answer period will follow. Samten was the spirtual advisor on the epic Martin Scorsese movie Kundun. The evening is being presented as a Selkirk College Mir Centre for Peace Café and begins at Nelson United Church at 7 p.m. with a suggested donation of $10 at the door. “This night is for anybody who has the time and anybody who is interested, it would be lovely to share my experience,” he says. Samten has written two books, one in Tibetan on the history of the Monastery of His Holiness the Dalai Lama and one in English, Ancient Teachings in Modern Times: Buddhism in the 21st Century. When asked what his ultimate purpose of his travels and teachings are, Samten says that’s not the point. Find out more information on the Yasodhara Ashram Buddhist Meditation Retreat. For more information on the Shambhala Centre visit their website.